2010-11 Revolution 30 jersey, Everything screened on. Hand-signed in silver paint pen by LeBron James (Cavaliers). LeBron James a.k.a. “The King” is now sporting a new uniform in a new city: South Beach, Florida. He’ll now be doing his scoring, rebounding and passing for the Miami Heat alongside the likes of All-Star teammates Dwyane Wade and Chris Bosh. 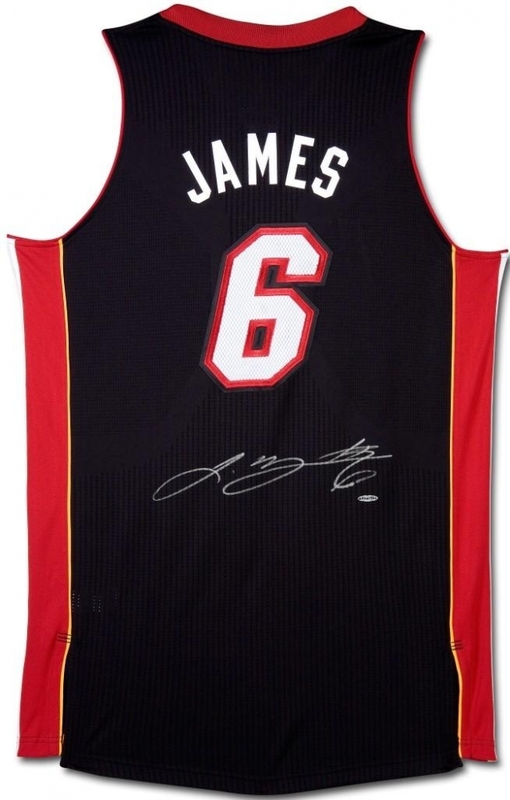 Here’s your chance to get in on LeBron’s Miami ground floor plan by purchasing this autographed authentic "Revolution 30" Miami Heat away black jersey. The new "Revolution 30" jersey is what every NBA player is wearing this year. While the emphasis is on comfort, the big reason for the new design is to avoid knock-off jerseys. What you are bidding on is the same style jersey LeBron wears, the 2010-11 Revolution 30 jersey.